This 600W combo amplifier features our fully featured 12-Band preamp with two 10" specially designed Celestion® loudspeakers and a high frequency horn. 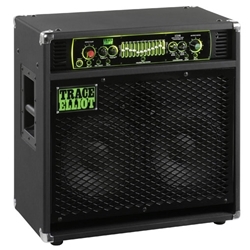 The cabinet is designed with an unobstructed bottom slot and tuned to 40 Hz for amazing tone and tight bass response. The high frequency horn has a switch for Off, Lo and Hi to provide control over the high frequencies. Although already an extremely versatile and powerful unit on its own, for more volume and 'mini-stack' performance we recommend using in combination with the 1518c cabinet. Dual-band Compressor with separate controls for each Hi and Lo bands. Output Mute switch, active on all outputs except Tuner Out. Electronically balanced XLR DI outputs for Pre EQ and Post Preamp Left & Right. Left and Right Line Outputs. Additional speaker output (8 Ohms minimum load). 600 Watts (4 Ohms) output stage (with additional speaker cabinet). Two 10" (254mm) specially designed Celestion® speakers. High frequency horn with variable attenuation. Footswitch allowing control of Pre Shape, Valve, Graphic EQ, Compressor, Effects Loop and Output Mute (included). Cabinet tuned, with bottom unobstructed slot, to 40Hz. Original classy black 'pimple' covered. Metal handles and protective corners. Protective Trace Elliot embroidered slip cover included.